The crown jewels. Gem stone tiaras. Long golden scepters. Diamond...everything. Long velvet robes with soft fur collars. But, with all those pretty things come people who want them. Other royalty. Thieves in the night (or day like Jim Moriarty). Everyone wants to know what it is like to wear those beautiful things. And, the fact that they come with a whole lot of power is nothing to scoff at. But, you don't have to go full Moriarty to get your hands on a crown. There is no need to rob the Tower of London. All you need is this Gold Queen's Tiara. 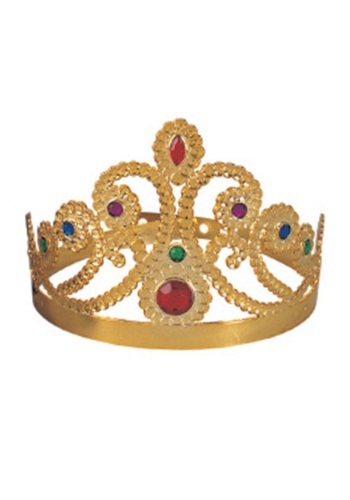 You can have all the power of a queen, and the beautiful jeweled crown. We can't guarantee that anyone will listen to your queenly power while you wear it, but honey, you should see how you look in a crown. Beautiful. Regal. Powerful. Queenly.